Waiters is averaging 10.5 points per game this season. Just when it looked like Dion Waiters was finding his niche and settling into an important role with the Cleveland Cavaliers, the 23-year-old shooting guard was traded on Monday to the Oklahoma City Thunder as part of a three-team deal in which the Cavs acquired guards J.R. Smith and Iman Shumpert from the New York Knicks, and the Knicks acquired forward Lance Thomas from OKC and forward Lou Amundson and center Alex Kirk from the Cavs. For Waiters, a third-year pro out of Syracuse University, it was the latest twist in what has been an eventful season. Over the summer, when LeBron James decided to leave the Miami Heat and return to the Cavs, Waiters suddenly went from a young building block in a rebuilding franchise to a highly-scrutinized, often scapegoated member of a potential championship squad. Days after the season began, Waiters went from a starter to a backup. And in November, he was at the center of a misunderstanding-turned-mini-controversy when his missing a pre-game playing of “The Star-Spangled Banner” national anthem led to the public revelation that Waiters is a practicing Muslim. After clearing the air around that potential career-killer (just as Mahmoud Abdul-Rauf about that), Waiters was starting to play his best basketball of the season in December 2014. He averaged 11.3 points and shot 44.2 percent from the field that month — including three games of 20-plus points off the bench — while the Cavs went 10-4 before James’ cumulative injuries took their toll and the team closed out the calendar with a three-game losing streak. 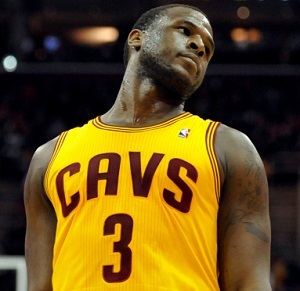 With James scheduled to be sidelined for a couple of weeks, it seemed this would be Waiters’ time to shine. In Cleveland’s only victory since LeBron went out, a 91-87 triumph over the Charlotte Hornets on Jan. 2, Waiters played arguably his most complete game of the year with 17 points, five rebounds and four steals. Three days later, however, Waiters was scratched from the lineup before Cleveland’s game against the Philadelphia 76ers as reports began to surface that Cleveland had reached an agreement to trade him. Some say it’s possible that this hot streak for Waiters and the kind words from coaches and teammates are merely harbingers to Waiters eventually being traded by the Cavs before this season is over in exchange for veteran help. And yes, that is definitely possible. Two weeks ago, nobody expected [Rajon] Rondo to get traded from the Celtics to the Dallas Mavericks, and nobody expected the Pistons to just up and cut highly-paid starter Josh Smith. In the NBA, it’s hard to predict what’s going to happen. So what happens next for Waiters? By going from the Cavs to the Thunder, he has arguably improved his odds of winning an NBA championship. Oklahoma City was 17-17 going into Monday’s schedule and has dealt with some injuries to key players, but when stars Kevin Durant and Russell Westbrook are both healthy, the Thunder are as good as any team in the league. Waiters will join a backcourt rotation that is headlined by Westbrook and Reggie Jackson, OKC’s third-leading scorer at 15.5 points per game. For a team that has been looking for a pure scorer on the wing ever since trading James Harden a couple years ago, Waiters could be the answer. And as I wrote before, given Cleveland coach David Blatt‘s pro-Israel stance during this summer’s Israel-Palestine violence, it’s possible that Waiters had problems playing for Blatt. His new coach, Scott Brooks, offers a fresh start. Durant has also said that the Thunder will strive to make Waiters feel welcome, which he may not have felt in Cleveland. While the basketball situation seems beneficial for Waiters, his personal and spiritual life may also get a boost moving from Ohio to Oklahoma. Former University of Kentucky linebacker Kamaal Ahmad, who grew up in Oklahoma, said in an interview with Ummah Sports that Oklahoma City has a big Muslim community. Also, nationally popular imam Suhaib Webb is based in Oklahoma. One thing Waiters did not deny or dispute during the national-anthem fallout was the reported claim that he’d recently decided to dedicate himself to strengthening his connection to Islam. I don’t know what kind of Muslim community Waiters had found in Ohio, but in Oklahoma City he should be able to find plenty of support as he grows in his deen.